The Mystery of Virginia Rep | Theater | Style Weekly - Richmond, VA local news, arts, and events. The cast of "Seussical" celebrates at the announcement of Virginia Rep, the consolidated moniker for a newly combined Barksdale Theater and Theatre IV. "A lot is changing but a lot is staying the same," says the company's associate artistic director, Chase Kniffen. It was the shot heard round the Richmond theater world: Local juggernauts Barksdale and Theatre IV were merging. While the two companies have operated in conjunction since 2001, they will restructure under the name Virginia Repertory Theatre, or Virginia Rep for short, effective July 1. "Everything fell into place, the time is right, and so we decided to make the move," says Bruce Miller, the company's artistic director. Barksdale began in 1953 when six actors from New York purchased the historic Hanover Tavern and created the nation's first dinner theater. Separate from Barksdale, Miller and managing director Phil Whiteway formed Theatre IV, the state's first professional children's theater, in 1975. After Barksdale ran into financial trouble 11 years ago, the organizations joined forces but maintained separate boards, budgets and communication systems. To expand the national profile of central Virginia's largest theater groups, Barksdale and Theatre IV decided to merge the two companies under one name. "It should be a lot smoother and easier for a lot of folks," Whiteway says. "The whole switchover will provide a clearer, more streamlined entity that all of us can work from as we reach out to the national funding community." After meeting with consultants and branding advisers about the transition, the organization's leaders decided to merge the two companies under a new name instead of using either Barksdale or Theatre IV. The new company will combine the organization's two boards of directors, payrolls, missions and charities. Though the hope is that the change will simplify the organization in the long run, things are a little confusing in the interim. The locations where the children's productions and the more adult fare are staged will be swapped. The children's productions will take place at the company's Willow Lawn space, instead of the November Theatre downtown, which until recently was named the Empire Theatre. These shows no longer will be produced under the Theatre IV moniker, but instead take the unwieldy name, "Virginia Rep's Children's Theatre of Virginia at Willow Lawn." 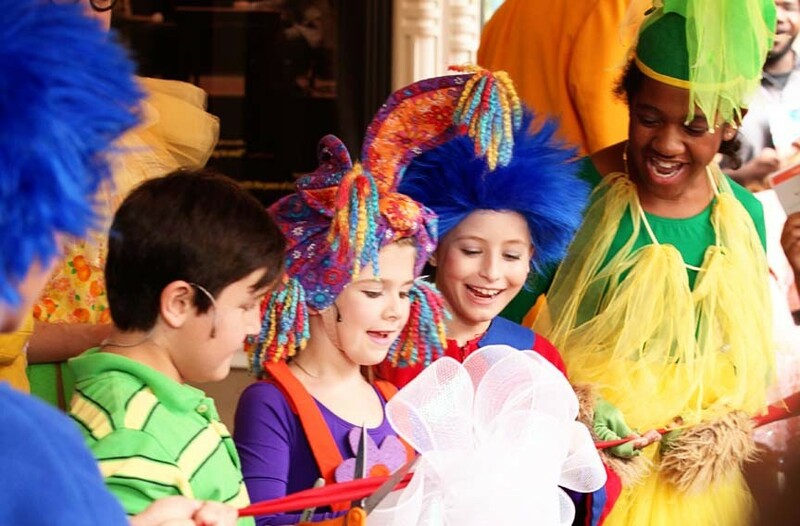 One large-scale children's or family show will be produced at the downtown space each season. The adult shows that once appeared at Willow Lawn will be staged downtown at the November Theatre, except for one show a season that will be performed at Theatre Gym, a black-box in the same building as the November. This has been renamed the Virginia Rep Center. The black box also will continue to serve as the space for a partner, Cadence Theatre Company. Swapping the venues will allow adult patrons to enjoy the restaurants and nightlife downtown, Miller says, and will offer easy parking to families at Willow Lawn without the worry of crossing a busy Broad Street. The shows that local audiences have come to expect at Hanover Tavern will remain at the venue, but will fall under the name Virginia Rep's Barksdale Season at Hanover Tavern. "It may be confusing for a while, as whenever you rename or re-brand something, but hopefully in the end it will be a lot clearer to patrons," says Chase Kniffen, the company's associate artistic director. "For several years we had to go 'Barksdale and Theatre IV are the same company, and I work for both.' A lot is changing but a lot is also staying the same." Miller says the company has other goals it wants to accomplish, including staging one world premiere a year and bringing in more artists from Broadway and out-of-town. "It really feels like a first-tier organization, which is what it's striving to be," says Kniffen, who's at work directing the explicit musical "Spring Awakening," which will debut as the company's first production in June. "It's no accident that 'Spring Awakening' is the first show of this new Virginia Repertory Theatre," Kniffen says. "It's certainly edgy, it pushes the envelope, but at the same time it's incredibly thought-provoking." It might take a while to get used to, but the organization hopes that these changes will gain the company more national stature. "I'm exceptionally proud of what the organization is now and what we will be in the future," Whiteway says. "We needed to present a stronger, higher-profile organization." "Spring Awakening" runs June 15-July 22 at the November Theatre at Virginia Rep Center. The play is suggested for people 16 or older. For information visit va-rep.org or call 282-2620.